The Finnish metal veterans continue their impressive resurgence on their tenth album. Nearly 17 years after delivering Tales From the Thousand Lakes, arguably the most influential metal album the great metal nation of Finland has ever put out, Amorphis finds itself enjoying a significant career upswing as of late. As recent as 2004, you couldn't have predicted that would ever happen, as the band was starting to stagnate creatively. Despite the subtle strengths of 2004's vastly underrated Far From the Sun (a record both the band and its fanbase have since disowned), it was clear Amorphis badly needed a good shot in the arm, which came a year later when longtime singer Pasi Koskinen was replaced by the relatively unknown Tomi Joutsen. With his long dreadlocks and outgoing stage presence, Joutsen was a big change from the more enigmatic Koskinen, but the real improvement was heard when he sang. Not only is Joutsen capable of a massive death metal roar, but he continually displays surprising clean vocal range, and the band's songwriters - guitarists Esa Holopainen and Tomi Koivusaari, and keyboardist Santeri Kallio - took full advantage of that latter talent on 2006's revelatory Eclipse. The singles were crossover successes in their home country, the album was a critical success, and most importantly, Amorphis suddenly found its fanbase expanding significantly. Since then it's been full speed ahead for the veteran musicians, as Amorphis has been very busy churning out the product, seeming like a band reborn. 2007's Silent Waters and 2009's Skyforger were even better records as Joutsen grew into his role. Last year's Magic & Mayhem was a surprisingly effective collection of re-recorded classics with Joutsen at the helm, while the CD/DVD Forging the Land of Thousand Lakes was a superb, detailed combination of live performances and a career retrospective. 2011, meanwhile, sees the band hopping right back on the horse again, and Amorphis's tenth album continues that remarkable positive momentum the sextet has been riding these last five years. 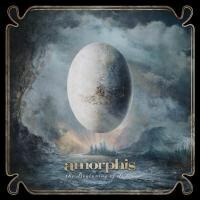 One of the best things about this current incarnation of Amorphis is how the band can put together a rather loftily-themed concept album about its Finnish heritage, yet remain accessible throughout. If you're into folklore and Finland's national epic "Kalevala", Amorphis never disappoints, but if you couldn't care less about the messages and just want to experience the music on a more visceral level, that's just fine as well, the music is plenty catchy and engaging enough. Consequently, although the focus of The Beginning of Times, this time around, is on the character Väinämöinen, the protagonist from the Kalevala, the overly arch lyrics never detract from the music, and for the fourth album in a row, the music is where the real strengths of this band lie. Amorphis has been reliant on a distinct formula for four straight albums now, but it's a good one. The influence of Finnish folk melodies is still subtly present in the guitar and keyboard melodies, but gone is the progressive rock inclination that the band was tinkering with before Joutsen came along. Instead, it's a slick, classy blend of death metal and melodic hard rock, massive riffs offset by the ornate keyboard melodies by Kallio, a perfect backdrop for Joutsen to showcase his versatility. What sets The Beginning of Times apart, however, is its restrained feel. The past three albums have been dominated by superb, pop-infused singles, but this record is more even-keeled. So while that big hooky moment never really happens, it's still a consistent, very strong piece of work. The first half of the album emphasizes the band's accessible side very well. "Battle For Light" kicks it off in understated fashion, Joutsen alternating between clean and harsh vocals atop a wistful, Celtic-inspired melody by Kallio. "My Enemy" is the closest we get to a song on the level of "House of Sleep" or "Silver Bride", but Joutsen pays up the band's aggressive side a lot more during the verses than we expect. "Mermaid" and "You I Need" see keyboard and guitar melodies interweaving beautifully, "Song of the Sage" bears a strong similarity to the last ten years of Iron Maiden, and "Reformation" utilizes harmony vocals to great effect, all without compromising the band's more metallic side. At 54 minutes the album does overplay its hand a touch, but that doesn't diminish The Beginning of Times much at all. It's a great pleasure to see Amorphis going through such a significant creative renaissance, and it's further proof that with Joutsen, this band has never sounded better.